“I feel so shallow . . . ” my drew says to me after reading my last blog. “What, why?” I was distraught. How could my love puppy think this? “No, I haven’t. After all this is not all about me,” I say as I interrupt him in mid sentence. So what is he referring to? My weight loss? I lost a lot of weight walking the streets of NYC. As a Licensed Real Estate Salesperson in Manhattan I get to wander all over the city with camera in hand . . . I love the elevator/doorman buildings and I’m mixed on those sixth floor walk-ups . . . except when you find that gem of an apartment at the top. It happens . . . so I hear! 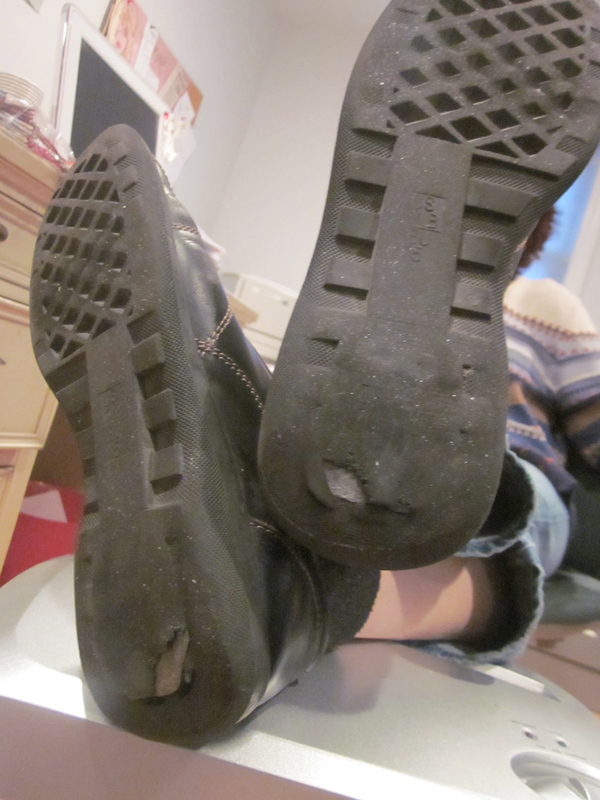 Time for a new pair of walking shoes. Any suggestions? I’m not sure what upset Drew about my post the other day. Was it the squirting grapefruit or the Ask Amy giggle? When I left the house today it was already starting to rain. According to the NY Times it was only going to drizzle. I left my rain jacket in the closet. I just didn’t want to walk around looking like a scoop of (green) mint ice cream. Before we left for Seattle I went searching for a rain jacket. Nothing in the stores for me. When I looked at my inbox I saw a 25% off and free shipping offer from Land’s End. This offer was ending at midnight (3 hours away.) They had a rain jacket with a fleece lining. I didn’t have time to think. Midnight was approaching fast. The problem was the color choices. The only color I ever like that they offer is black. I shoulda went with it but I was trying to get springy. I just thought I should get a color-other-than-black. I would have preferred gray or olive-green but all they offer are these off colors that I really don’t care for. So I ordered the green . . . and I don’t care for it. I wouldn’t mind neon or olive. If I had time I would have returned it but we were leaving for Seattle a few days later. I haven’t gotten used to the color. I keep telling myself that I like it but then I see my reflection and quickly look away. It did keep me dry and, if not for the color, it worked well — hood was good, pockets zippered. Don’t care for the little circles of velcro along the zipper. So I didn’t wear it today because I thought I might run into someone I knew. I don’t know why. Who goes walking in the rain around here? I do love the ecco biom trainers that I bought. Feels like I’m walking barefoot — and from what I’ve read that is the big thing these days — that barefoot feeling. The ecco biom walkers are leather and too thick but the trainers are mesh. My feet are happy when I wear them. The salesperson at the Walking Store assured me that it’s okay to walk in trainers and that my feet will stay dry. 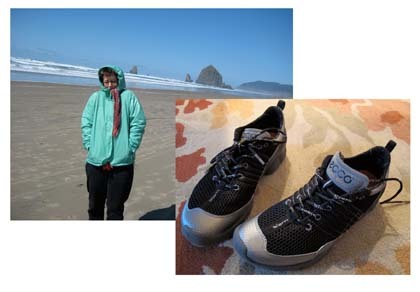 I did believe her but I still wrote to ecco asking them about the trainers — are they good for walking? Will my feet stay dry? They never responded. I wore them and I’m happy but I’m still waiting for an answer a month later!! And now something about Drew –He moved to his new office this week. He needs help in setting up his furniture. See Drew sit. See Drew work. He is busy. He drew this picture. Maybe I’m a bit optimistic but I think Stanley’s days of living it up in my house are coming to an end. Yesterday I was so traumatized by his presence in the crawl space that I didn’t get a good night’s sleep. I wasn’t home today so I don’t know for sure if he’s been around but I just couldn’t get him out of my mind. I called Mady and she gave me the name of a trapper. It was one of those “friend of a friend’ referrals. I called him. I wasn’t sure what I was going to say. We spoke and he gave me a few good pointers. Most importantly he said, and he is not the only one, that the squirrel probably found another way out or it would be dead. Look for a fresh pile of saw dust. I went out back and crawled around and found what looked like saw dust and above it — a hole. Yup, I found it. Well, I think I feel better because now I know he isn’t trapped and he won’t wind up dead in my house. Tomorrow night I will set up a trap on the outside. 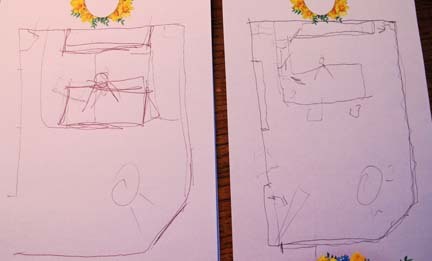 I’ll probably have to use some patio blocks to line up the trap’s opening to the hole in the house. I say tomorrow night because tonight my partner -in-squirrel -trapping is at the Elton John concert at the Garden. Drew wants no part of it, so I’ll wait. Getting a new garden shed on Monday. Yay! I’m concerned because I’m having my old shed torn down in the next day or so and I don’t want this to interfere with my squirrel trapping. Maybe I can get them to keep down the noise . . . cut down that metal shed quietly, please. Preparing for trip to Seattle . . haircut today, color tomorrow. Bought walking shoes and a raincoat. Am I repeating myself? Signing up for a cooking class one afternoon . . .
Just started reading The Memory Palace. It’s a 2 week loan so I’ll finish it before we leave. Need to bring 2 books with me.